Tell us about your service experience. While serving in Afghanistan, I saw a rocket streak over my head and it scared me to death. However, I alerted my fellow soldiers of the impending danger and we all went to the bunker and were safe and sound. Although I derived PTSD from this and other events, I did become stronger overall that day. So, no matter how bad things get that you face in life, you can move forward and have a great one. Just keep pushing toward your greatness! What are some of your memorable experiences in college? I am just getting started here but Mrs. Sandra (Roman) and Mrs. Ines (Paulino-Chindra), the Registrar’s Office staff members who assist veterans, were extremely helpful in helping process my GI Bill paperwork and e-mailed me every step of the way to let me know what was going on. Any favorite classes? Spanish 101 with Ms. (Nina) Gonzales and History of Psychology with Dr. (James) November; specifically, singing the alphabet in Spanish, and in Dr. November’s class, our discussion about overcoming racial barriers. Tell us about JU’s role in your transition to civilian life. 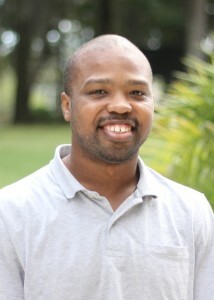 I am in an environment full of staff and students alike who are willing to help and support me. My first week, a fellow student was willing to help me with using a book I needed until I got mine, and even went above and beyond and brought it to my home. What sets JU apart? The smaller, more interpersonal classroom setting, which really promotes student bonding. The beautiful landscape makes the university a great venue for learning and even just relaxing — like the gazebo at the Council building. I enjoy just sitting there until my next class starts. What might surprise others about you? I can sing very well and have even won a Karaoke contest. I can also bake one of the best apple cobblers you have ever tasted. 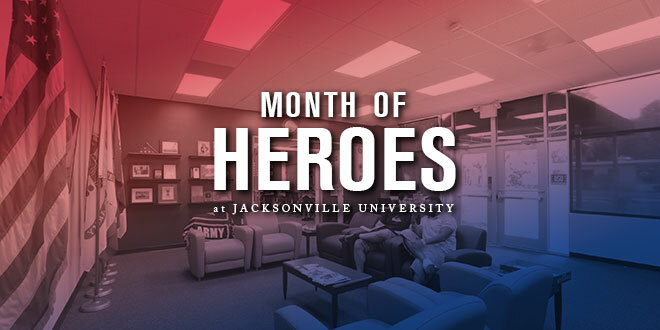 Meet the other students we’re recognizing during the Month of Heroes, learn more about our military students and alumni here on Wave Magazine, or visit the Veterans and Military Resource Center online to learn how JU serves those who’ve served.